Yes, one. Yes, it can be done. Now I will preface by saying we only have one kid. We also did this when Little V was 18 months old. I didn’t have to bring a breast pump, and we didn’t have to worry about bottles, so I personally found it easier to pack for an almost-toddler than a little baby. Time will tell whether we can pull this off again when V gets older, but hopefully she’ll be able to carry a little backpack of her own next year! We always do carry-on. I hate checking in bags. You waste time checking it in and you waste time waiting for it at baggage claim. There is always a chance your suitcase will get lost and something inside will get damaged. In certain countries they will even rummage through your stuff. No, thank you. Ok, but you get a carry-on per person. Why try to fit it all in a single suitcase? Since we decided to bring a stroller and a car seat along on this trip, we wanted to have as little additional baggage as possible. But the primary reason was specific to me. With my ongoing chronic foot pain, I’m unable to carry and lift as many things as I used to, and the less we had, the better it would be for my physical health (and everyone involved). In addition, we were planning on doing local flights within England, and one particular airline charged extra for carry-ons (backpacks were free). So there was a financial incentive for us as well. I was up for the challenge. Mr. Wonderful was doubtful. But…we did it! Maybe some of these packing tips will be helpful for you, too. Pack in layers. We were going to Great Britain and knew the weather was going to range from 50-70 °F, so I packed a couple of tank tops, a couple of tees, one long-sleeve turtleneck, one sweater, and a cardigan. For bottoms I included shorts, lightweight black pants and wore jeans on the plane. Pack neutrals. Black goes with…everything. I’m not a fan of white because it’s easy to pick up stains, but light gray is a decent alternative. I also like black and white striped tops, which adds some interest but is also versatile. Ladies…this dress. 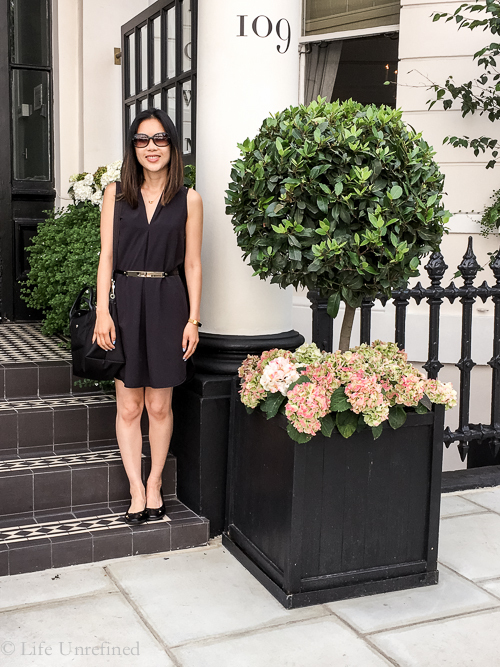 I discovered it by accident one day, and it has definitely become my favorite travel dress. You can put it in the washer AND dryer, and it can be dressed up with a belt or worn as a casual shift dress with sneakers. Ladies…if you need a pair of dressy shoes, stick with flats. Nothing takes up more useless space than a pair of heels. Guys…these pants. I read about them in a travel blog and bought a pair for Mr. Wonderful. At first he was like, “Why did you buy me $200 pants? !#&*?” and then…he bought another pair. On our trip he wore them to a park, afternoon tea, and a Michelin star restaurant. He dumped water on them, and it rolled off like a dream. They wash and dry wonderfully. Some things are possibly worth the price. Also, they’re made in NYC. Compression sacks and compression cubes. This is part of the secret. If you can get over the fact your kid’s clothes will be wrinkly, I recommend stuffing them into a compression sack. We were able to stuff a week’s worth of V’s clothing into a 5-liter. We divided our own clothing into the cubes (which don’t compress as well as the sack, but also doesn’t make your clothes wrinkle too much, either). Vacuum pack the extra diapers. 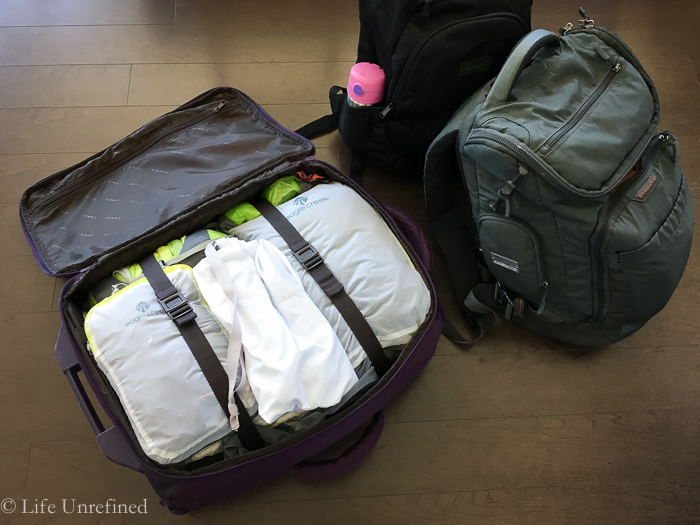 When we travel, I make sure there are about 8 loose diapers in my backpack. On average V goes through 5-6 diapers a day, so there’s a few extra in case of accidents. We also want to make sure there’s enough to get us through the first couple of days in case we can’t immediately find a store that sells diapers, so Mr. Wonderful came up with the idea of vacuum-packing an extra 20 or so diapers. It shrinks down the size by more than half! Bring flat activities and thin paperback books. Entertainment does not have to take up lots of room. The local craft store has great ideas that don’t cost much – sticker books, coloring books, and quick crafts can be found in the dollar bin. I also went to the party store for cheap party favors that work well as disposable toys. Bring along a compact duffel bag. This one folded down quite small and was quite handy for souvenirs and other purchases (which of course resulted in two carry-ons for the flight home). Utilize every nook and cranny. Was there room for anything else? Yes! We managed to fit in both of our flip flops for the beach, swimsuits, swim diapers, my flat-iron, and a crossbody bag for more formal occasions. Make sure all your clothing is easy to wash and easy to dry. You may know this already, but packing for a month-long trip is the same as packing for a week. If you’re planning on staying at an Airbnb with a washer/dryer (a recommendation if you have kids! ), then stick to machine washable clothing. If you’re only staying at hotels and don’t want to pay the exorbitant dry cleaning fees, then pack clothing that you can hand-wash and will air dry in a day. REI, Lululemon, and Athleta often have great options. Hope this was helpful! Do you have any tips for streamlining your packing? (8) Do not marry a boy scout (or their ilk), as you will be prepared for every possible scenario when traveling (no names mentioned). (9) It helps if you are an exceptionally not-sweaty family, so you can wear your clothes more than once (I know that’s your real secret trick). (10) Do not allow your husband to run on vacation, as his running shoes will take up at least half a carry-on, but no one wants to wear those on a long plane ride or out to a restaurant (no names mentioned). (11) Do not travel with anyone who uses an excessive amount of face creams, hair sprays, blow dryers, and other such products (extended family, no names mentioned). You are impressive! I could surely never hope to achieve such results. True packing and travel masters! oops! Those should have started with 11. Serious question: How do you re-pack for your second destination or get everything home, since you had to vacuum pack to get it there? Do you have to bring a machine with you or count on your place having a vacuum?